Stocks gyrated on Wednesday as Wall Street tried to interpret a release from the Federal Reserve which summarized its crucial meeting last month where the central bank indicated it would be patient on future rate hikes. As of 2:30 p.m. ET, the Dow Jones Industrial Average traded 21 points higher and briefly rose nearly 100 points. The S&P 500 hovered just above the flatline, while the Nasdaq Composite was down 0.1 percent. 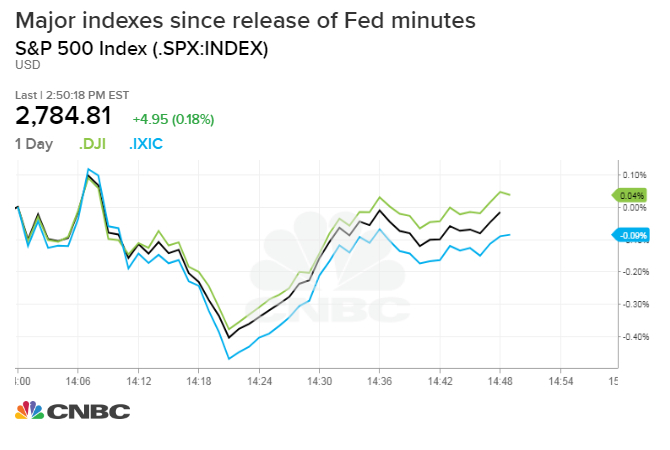 The three indexes reached their session highs right after the minutes were released. The U.S. dollar hit its session low after the minutes were released, but later recovered to trade around breakeven. The Cboe Volatility Index (VIX), considered the best gauge of fear in the market, was down 3.2 percent at 14.4. Southwest airlines fell nearly 5 percent after slashing its revenue guidance. The company said the recent U.S. government shutdown cost it $60 million in sales.